The Toluca Lake Christmas Trees. 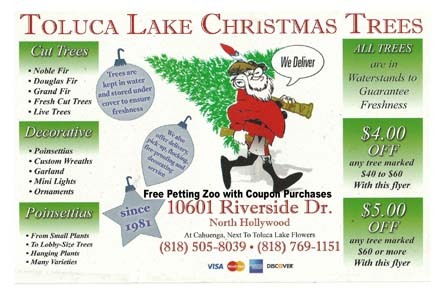 We have the best and widest selection of Christams Trees in the San Fernando- Los Angeles area. Children can also enjoy the Petting Zoo. 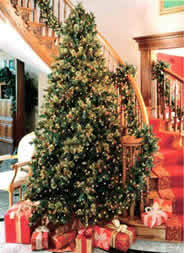 During Christmas we have the most exquisite selection of Christmas Trees at affordable prices. The Petting Zoo is also available throughout December. 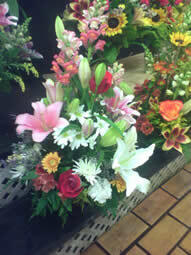 We have the best flower quality and incredible customized flower arrangements for all occasions. Toluca Lake Florist in North Hollywood has serviced the Greater Los Angeles community for over 66 years. The Toluca Lake Florist will cater to all your personal and holiday floral needs. We have holiday centerpieces, beautiful bouquets, gourmet baskets and stunning floral arrangements made fresh to order. We also supply a wide variety of wicker baskets, ceramic pots and glass vases to complete your arrangements. We invite you to visit our shop where you can select your fresh flowers personally, or visit us online where you will find a vast selection to suit every occasion. Toluca Lake Florist can provide flowers for banquets, holiday parties and special gifts to loved ones. Noble Firs, Grand Firs, Douglas Firs,and more..
Noble Firs have 4-sided needles that are over 1 inch long; they are bluish-green but appear silver because of two white rows of stomata on the underside and one to two rows on the upper surface. The tree's short, stiff branches are great for heavier ornaments, making it a popular Christmas tree. It is also used to make wreaths, door swags and garland. Grand Firs have needles that are 1 to 1 ½ inches long with glossy dark green tops and two highly visible white lines of stomata on the undersides. When the needles are crushed, they give off a citrus smell. Douglas Firs have a good fragrance. They are a blue to dark green color with 1 inch to 1-½ inches needles that are soft to the touch and radiate out through the branches. Douglas fir needles give off one of the best aromas when crushed.